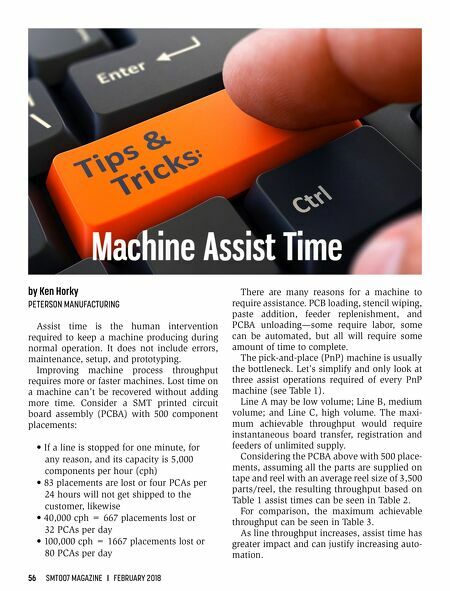 56 SMT007 MAGAZINE I FEBRUARY 2018 by Ken Horky PETERSON MANUFACTURING Assist time is the human intervention required to keep a machine producing during normal operation. It does not include errors, maintenance, setup, and prototyping. Improving machine process throughput requires more or faster machines. Lost time on a machine can't be recovered without adding more time. 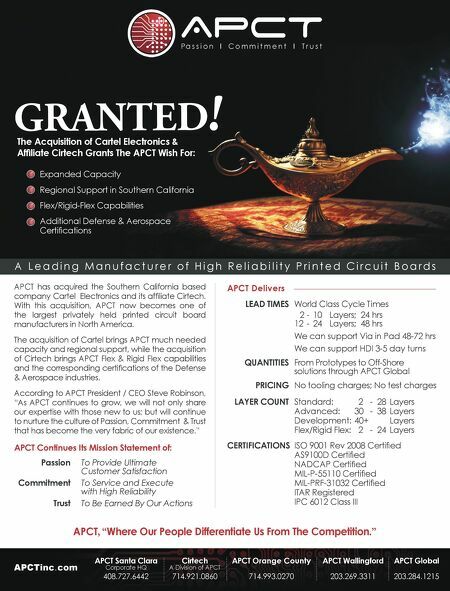 Consider a SMT printed circuit board assembly (PCBA) with 500 component placements: • If a line is stopped for one minute, for any reason, and its capacity is 5,000 components per hour (cph) • 83 placements are lost or four PCAs per 24 hours will not get shipped to the customer, likewise • 40,000 cph = 667 placements lost or 32 PCAs per day • 100,000 cph = 1667 placements lost or 80 PCAs per day There are many reasons for a machine to require assistance. PCB loading, stencil wiping, paste addition, feeder replenishment, and PCBA unloading—some require labor, some can be automated, but all will require some amount of time to complete. The pick-and-place (PnP) machine is usually the bottleneck. Let's simplify and only look at three assist operations required of every PnP machine (see Table 1). Line A may be low volume; Line B, medium volume; and Line C, high volume. The maxi- mum achievable throughput would require instantaneous board transfer, registration and feeders of unlimited supply. Considering the PCBA above with 500 place- ments, assuming all the parts are supplied on tape and reel with an average reel size of 3,500 parts/reel, the resulting throughput based on Table 1 assist times can be seen in Table 2. For comparison, the maximum achievable throughput can be seen in Table 3. As line throughput increases, assist time has greater impact and can justify increasing auto- mation.